Paper Pursuits: All About Fonts--JustRite Blog Hop!!! All About Fonts--JustRite Blog Hop!!! Welcome to my stop on JustRite Stampers' Mega Font Hop, day one! I am so thrilled to be a part of this fabulous parade of JustRite projects and ideas! The focus of this hop is on FONTS. There are so many things you can do with the various styles and sizes of JustRite fonts--the possibilities are endless! JustRite is celebrating their Mega Font Hop (a 2 Day Event with 54 designers) in style with a Super7 Day Font Sale. Take 30% off all JustRite font sets and the Horizontal and Vertical Font Stampers. The sale begins September 17th and ends September 24th. For my first project today, I decided to make myself a set of little Autumn-themed monogrammed note cards. I love fall and I rarely make anything just for me, but these are now sitting on my desk, making me smile every time I look at them. For this project I used a sweet little wooden "bag" I got at Michaels for $1.00--can't beat that, LOL--that I covered inside and out with paper and dressed up! I used the Special Occasion Uppercase and Brayton Uppercase font sets, the 2 1/4" x 3 1/16" Oval Wood Stamper, the Horizontal Wood Stamper, and the Autumn Blessings Borders & Centers. To get my monogram in the center of the smaller leaf border for the cards, I masked off the center sentiment with Eclipse masking tape, inked it up, removed the tape, and stamped. I know I could have cut the center out of my stamp--I've seen this done before--but I just COULD NOT bring myself to do it! So this was a good compromise. I colored the leaves in both borders with Copic markers. Then I stamped my monogram in the center, using the horizontal stamping block and my Stamp-a-ma-jig to get it lined up properly. I used the same method to stamp the sentiment inside the card, and I decided on just a simple monogram for the envelope flap. I made 4 little cards and envelopes (I found a tutorial here, but I went one step further and lined my envelopes with patterned paper) and they fit perfectly in this little "bag". I couldn't resist doing a little Christmas project, too. I love non-traditional Christmas colors, especially pastels. Last year I did some projects for my living room with this Christmas Shimmer Paper collection by Heidi Grace so I decided to do something to match them. I also love candles, so I dressed up a Yankee Candle jar candle. For this project I used a border from Christmas Joy Borders & Centers Oval 1-3/4” x 2-5/16” the 1-3/4 x 2-5/16" Wood Stamper and the Brayton Uppercase font set. I again masked off part of the border image and added the center sentiment letters before stamping and coloring the holly with Copic markers. I also added a little shimmer with a Sakura glitter pen. I love the vintage look and tried to replicate that on this project by adding a big ole ribbon and bow and some buttons. The top looked pretty bare, so I dressed it up a little with some Heidi Grace glittered holly leaves and more buttons to serve as berries. I think this candle will look very festive in my living room this year! There is Mystery Blog Candy being given away during the Two Day Just Rite Font Blog Hop!!! Why is it a Mystery? Well, there will be 3 blog candy giveaways on each day and you can only win by leaving a comment on the right blog! The real surprise is you won't know which blog has the candy.....even the designer doesn't know! So as you visit each of the 54 designers over the two day event take time to leave a comment.....who knows, the lucky winner may be you!!!!! You have until Sunday at noon to leave a comment for your chance to win. Then check back at the JustRite Blog on Sunday evening to find out who won!!!! Enjoy the Hop. Now check out these fabulous day one designers!! And start at the Just Rite blog tomorrow for the day two list! Beautiful Fall is one of my favorite seasons love what you did with the stamps. I love what you've done here. Such pretty fall colors! Great ideas!! Beautiful fall colors, too. Thanks for sharing! Just beautiful. I love fall and the colors are stunning. Thanks for the idea of decorating a Yankee Candle. love the matching envelopes to your set. Very cute! Think I'll find a yummy candle to burn now! 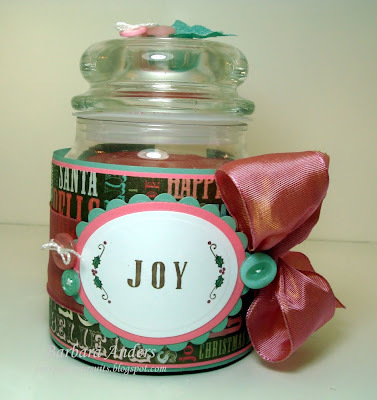 Love the monogrammed cards & wooden box and the decorated Christmas jar. God bless! A beautiful autumn box - the colors are perfect! Thanks for sharing your ideas. Beautiful fall projects. You are very talented. The fall note cards set are beautiful. I like the colors. The candy jar is pretty. You did a great job! All the individual pieces are nicely coordinated. All the individual pieces are nicely coordinated with your font! Both are so cool! You are so creative! FABULOUS projects, Bar! The notecards are perfect in every detail, right down to the lined envelopes! And I love the candle jar, too! The ribbon is GORGEOUS and the buttons too, with the simple sentiment that says it all! Fantastic projects! I really LOVE your memo set...absolutely gorgeous!You jar is so fun! Love the holly and buttons on top! Thanks for the fantastic inspiration! What a cute box. I also love Fall. I love that you've done a gift for yourself. What a great thing to sit down to and start crafting every day! Barbara, that little note card box is adorable! I, too, love autumn and I can see why seeing it on your desk makes you happy! Beautiful set! I like how you used a fancy font for the first letter of each word...looks lovely. I've got to get some of these stamps. Fabulous projects. You are very creative. I LOVE your card set. fall is my favorite season, I just love the colors. Love the box. Great fall project. Perfectly charming!!! I love Fall. Barbara Beautiful work. Great examples. I'm glad I found your blog. Thank you for sharing. Just a beautiful little box and so "you." Nice and vintage-y and warm and appealing. Lovely projects, thanks so much for sharing. I love all the fall colors. This is so gorgeous! Love the beautiful fall colours and your Christmas candle is so pretty! Beautiful projects! I especially like the custom center you created for the leaf border! Great work! My boyfriend loves anything AUTUMN, so now I've got some new ideas to try. THANKS! Great idea and beautiful work. Lovely fall colors! Thanks for the wonderful ideas. What a lovely fall set...and love what you did with that candle. It is so much fun to personalize those special items! Take good care, Barbara! Wow those are great projects. I love the not card idea. What fun. What fantastic projects Barbara! I love the Autumn design...my favorite time of the year! Thanks so much for the inspiration! Love your notecard set. Glad you got to make something just for yourself. Way to treat yourself! Love your projects. Thanks for sharing! Oh, these are wonderful. Fall is my favorite time of year and I love the projects you did with those colors. love all the fall colors on your projects. Great projects! I love those fall colors. Thanks for the hop. Love your ideas! I have the jars & the bags, but I'll start with Halloween decorations first! Can't wait to decorate the bags for my grandkids! Thanks! love your fall colored projects! Looking forward to owning some JustRite products so I can try out some of these great ideas. How can I resist now that they are on sale? Love the monogram. Such variety with JustRite. Barbara, those projects are stunning!!! I love what you have done with the stamps. And the colors you chose are beautiful! I LOVE the first project you did....so pretty! Great job, love this idea. This blog hop is so much fun! Your work is so beautiful. I love the fall and the colors. But most of all I love ending up with something so beautiful for almost nothing. Thanks. I love how you combined the two fonts on the first project. It is beautiful. Thanks for sharing. Love your projects with these wondeful JustRite stamps! Love the notecards! And I have some of those little jars that I may have to put to use now! TFS! Wow, such a pretty basket! Great fall ideas i like it.Greetings from finland. I've seen these little wooden boxes but it took your imagination to show me what could be done with them...Love It !!! Great fall colors, love how you monogrammed the envelope. Gorgeous. Love your work, it's inspirational!I love these fonts, guess I better grab some while they're on sale, and what a nice surprise, they come in a complete set of 3 sizes. Thanks www.justrightstampers.com! Fabulous Projects. Very inspiring to create some of my own. Wow, what beautiful creations! I just love the fall colors and all of your techniques are great. Great ideas and projects as usual. Thanks for the great ideas. Love the bag! A great idea for a gift holder. Great projects. I especially love the note cards and bag. Love all your work Barbara... Just wonderful!! Beautiful work, love autumnal colours. Lovely aumtumn projects, thank you. so cute! I love the fall colors. I started using JR Stamps to make Monograms, and yours are really nice! I always used them for wedding cards, and I forget about notecards! Thanks for the reminder, and for your sharing your nice work! Love the fall colors. Great projects! Dottie K.
I love your work. Thanks for sharing it. Great colors, love the note card set. Love your note bag! I've been eyeing those for awhile now, and I think I might just have to break down and buy some :) Thanks for sharing. Such cute projects. I love what you came up with. I love the card holder you have made! Thank you for the inspiration! Cute projects you designed! Love the pretty fall colors. Great idea for decorating the candle, too. Please use the email address below my name. Thanks. Thanks for sharing the beautiful projects. All the hoppers are convincing me i have to come up with some money for this sale. Very cute. Your coloring is amazing. Love your projects, what a great gift idea dressing up a candle! Wonderful projects-thanks for the ideas! love the fall colors - very nice! Great project. Dressed it up quite nicely. Love those fall colors. Thank you for sharing these wonderful projects. Wonderful fall card ensemble. The monogram on the front of the card is classic and simple and compliments the fancy bow beautifully. Love it! You can't go wrong with these colors for Autumn! Very creative. I especially love your cute monogram cards & autumn card tote!!! Love your fall project and the Christmas candle. Great job! Fabulous projects! Love the fall set. TFS! I love the special occasions font! Thanks for sharing - good idea to use the stampamajig! 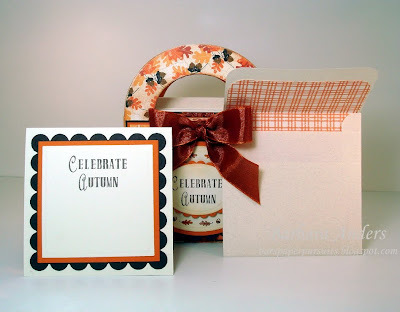 These are the most adorable fall cards and holder - love it. Pretty matching envelopes too. Thank you so much for sharing this. These are all such neat projects. So pretty. Lovely colors. I also like the non-traditional Christmas colors. Pretty work! I love your little bag - it's absolutely precious. And the glitter leave on the jar - that's what I'm all about - more glitter...Beautiful. Love the fall colors. Beautiful projects. I love fall and your project portarys it beautifully. Love how you covered the wooden bag! Wonderful colours and so creative..
Great ideas!! Such pretty fall colors! Thanks for sharing! These are fabulous and would make perfect gifts! What a wonderfu idea for a gift. Thanks for sharing this. I am in Love with this project. I must give it a try. Looks like a lot of fun. Hope I can do as good as you have. Beautiful projects, thanks for sharing them. Just love the note card set. Love the box...great tips for using only part of a stamp. Your projects are outstanding and love the colors. Thanks for sharing. Beautiful fall projects. Love the notes and Christmas jar, too. Very cute Autumn tote! The candle would be a great gift. i just love the colors in the note card holder! Love the monogram. Beautiful Barbara! 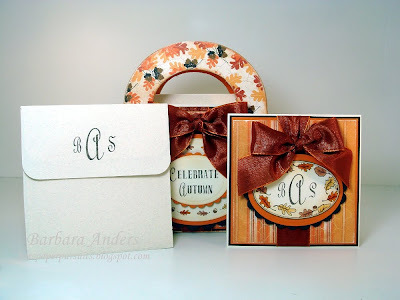 I love the little wooden bag and how you used the two different fonts on it and how you decorated your envelopes. What great ideas for gifts! I can't wait to try the notecard holder! I love your ideas... Thanks for sharing! Nicely done! What nice projects for me to follow! 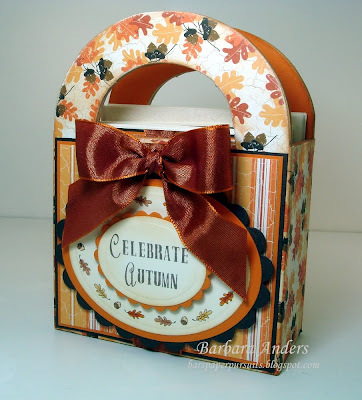 Lovely set of autumn cards and cute box too. Love how you decorated the candle too so pretty. Thank you for sharing. 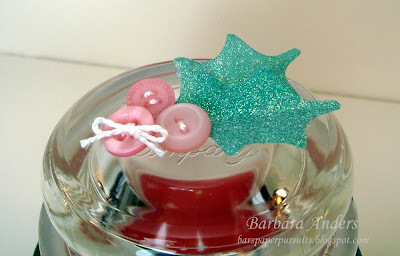 Phyllis M.
What a cute set and a great idea to dress up a candle! What a great ideas, thnx for sharing it with us! Beautiful project! Love the fall colors. Love those note cards. Fall is my favorite season, and I love them. Thanks for sharing. Fall is my favorite season as well. I love how you dressed up the wooden box. I can't wait to dress up some candles too! Trick or Treat with WTG--and Flopsey!